Is one of your resolutions to move more? Here's your chance. Ready to take on one of California's beautiful and spectacularly stark national parks? 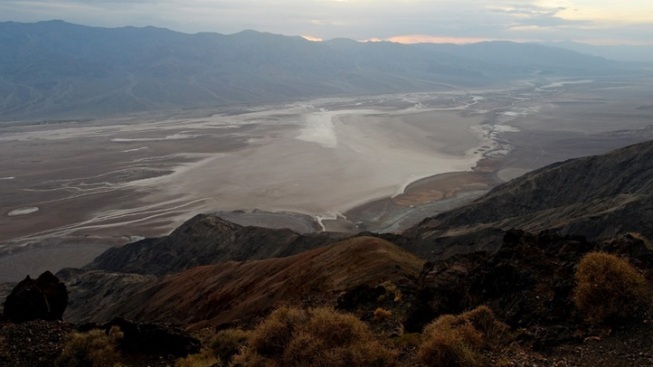 A new Death Valley hike program is ahead for 2015. UNDER THE VAST SKY: The end of a year and the beginning of a new one is very much the time of Penciling in Big Ideas for Changing Up One's Life, Positively. Eating better is often among those, as is seeing friends, starting a long-put-off project, traveling, and getting more fresh air and exercise. Many of those Big Ideas dovetail nicely in the recently announced Hike Death Valley Program, a new-to-the-national-park deal that involves getting a decal, a few selfies and/or photos, and trail-oriented achievement. Could you look at your Big Ideas list and check off travel, seeing friends, getting fresh air and exercise, should you participate? Yep; it's one of those programs that encompasses so very much. HERE'S THE UPSHOT: "Simply hike trails from the designated list to earn points," says the national park's Facebook page. Those trails include three miles in Desolation Canyon, four miles in Mosaic Canyon, and two miles at Darwin Falls. The trails fall into a few sections -- Basic, Intermediate, Advanced, and ADA Friendly -- and hikers who obtain four points by hiking a few of the trails on the list nab a waterproof decal. Posting photos and a bit about your hike online is in the cards here, and visiting a ranger for your decal. IS THERE A COLLECTION ELEMENT TO IT? You bet. The trails will switch up in 2016, as will the decal, so if you start now, you're in the front door on this brand-new program. Isn't it the best to start at the start with something fun, collectible, and nature-oriented? You'll never have decal-envy of you jump into the hiking scene in 2015. WAIT: If Death Valley had an actual front door, where would it appear? We say somewhere deep within the Panamint Range, possibly near Telescope Peak.